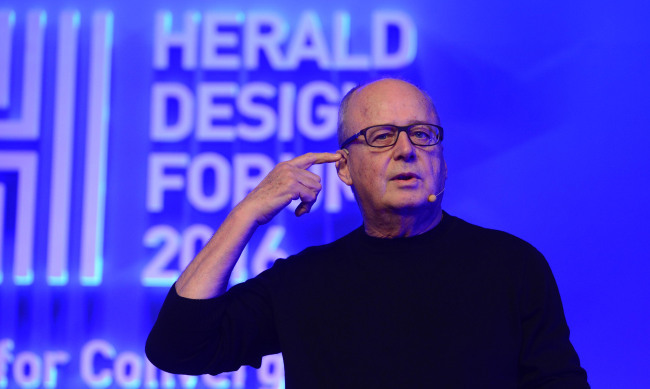 Alberto Alessi, the CEO of Italian houseware company Alessi, and Ko Tae-yong, a fashion designer and CEO of Beyond Closet based in Seoul, talked about expanding the horizons of design through collaboration at the first session of the Herald Design Premium Talk on Tuesday. At the exclusive event held at the Grand Hyatt Seoul Regency Room, the Italian design guru and the rising star in Korean fashion agreed on the significance of collaborating not only within the industry, but also across industries, which can change the flow of business. Alessi introduced master artisans, architects and other designers with whom he has worked. And he didn’t shy away from talking about failures. “Although we were aware of failures, we couldn’t reject collaborations because of relations with them,” Alessi said. Alessi indicated he can be courageous enough to risk getting close to the borderline because he knows how hard it is to convince consumers with expensive “made in Italy” products. Korean designer Ko shared some of his successful collaboration projects over the past nine years since he started his own brand. Ko jumped into the fashion business by selling odd pieces of clothing on social media in 2006 when he was 26. He is now one of the top designers in contemporary Korean fashion. His 9-year-old brand Beyond Closet has collaborated with a number of partners, including a veterinary hospital to design animal uniforms, bakery franchise Tous Les Jours and British pop musician Mika, as well as sunglasses and bike manufacturers. In a collaborative project with ING Life Insurance, which surprised many in both the fashion and insurance industries, Ko wanted to express what he thought about today’s young generations who enjoy lavish spending on themselves by using ING’s corporate color orange. The insurer wanted to launch a new financial program for 20- and 30-somethings. “My brand is thriving as I intended, in a manner that keeps both artistry and commerciality,” Ko said.